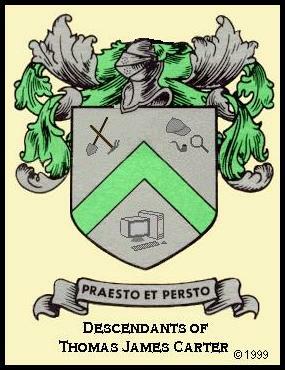 Click here to learn about this family crest. Tim Carter once put up a website to honor our ancestors and hopefully find many new cousins. Tim had a major stroke in July, 2001. He died later that year. His website was knocked offline that summer. This is an effort to begin construction of a new family website in his memory. Unless otherwise noted, all images and text on this site were created by JesPiddlin - copyright 2004. Genealogy is the original work of Tim Carter and continues to be enhanced by the research of many other caring, sharing family members.